The following article was written by Jennifer Cikaluk as part of a series about filmmakers coming to the Salt Spring Film Festival on March 1-3, 2019. Filmmaker Greg Durrell will be attending the festival and leading a discussion about his film following the screening. The Filmmaker series is sponsored by Mid Island Co-op. Design Canada is a film which chronicles the becoming of Canada’s identity. When you take a look at Canadian iconic graphic design, it is easy to see Canada is one of the most well branded countries in the world. But where did it all begin? 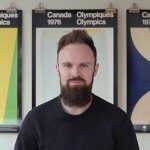 Greg Durrell, a graphic designer and partner of a Vancouver based design firm, first became interested in graphic design in high school. He dreamed about being on the design team for the Olympic Games and eventually that is exactly what he did. Inspired by the design of iconic Canadian logos and symbols, like Canadian National Railway and the Montreal Olympics in 1976, Greg decided to take a deeper look into the period of time when Canada was looking to define its image and to meet the legends that made it happen. This deeper look resulted in the making of the documentary film, Design Canada, which examines graphic communication through the icons and symbols that helped define Canada in the 60’s and 70’s. The film takes us on a journey through the golden era of Canadian design, honoring a seminal period in Canada’s development as a nation. Design Canada focuses on the mid 20th Century, a time when the Modernist movement was shaping a new attitude and style towards design. After World War II, European immigrants, displaced by war and social conditions were welcomed to Canada. Designers, architects, and graphic designers—mostly white men from England, France and Germany—brought European Modernism to Canada. The modernist Swiss Style of design was developed in the 1950’s and expanded beyond Switzerland’s borders in the 60’s and 70’s. Post war immigration to Canada brought European designers with Modernist influences in graphic design. It was a style characterised by its clarity and order and it was accessible with an ability to communicate. Swiss Design’s pure minimalistic and objective principles made it cool. It was a perfect match for Canada’s design evolution at the time. Canada was looking for its makeover and looking to break free from its colonial influences. The centennial was approaching, and it was time for Canada to establish its own independent narrative. Many Canadians were eager to leave the British Union Jack behind and create their own flag. The design ambition of the new Canadian flag was to reflect a unity of people and differences, a oneness. In 1964 Prime Minister Lester B. Pearson, whose platform focused on national identity, introduced the Flag Bill and the search for a new flag began. Eventually it was agreed upon and the Maple Leaf was inaugurated. It was the beginning of a time that would clarify and define what it meant to be Canadian. Following the 1967 centennial celebration of Canadian Confederation, Canada was ready to share its newly defined self with the world. The opportunity came with Expo ‘67 in Montreal. It would prove to be a perfect showcase of Canada’s innovation in design. A team of designers were commissioned to produce some of the most legendary modernist architecture and design in Canada’s history. The enormous project of constructing the Canadian brand was rolled out in the typeface, the logo, the architecture and even in the parking signage at Expo ‘67. It was a celebration of who Canada had become as a country. The 1970’s was a time to galvanize Canada’s national identity and further position the country as leaders in design. Team Canada won the World Championship Hockey match against Russia in 1970. They were wearing the iconic Maple Leaf sweater. That win seared the Maple Leaf image into our history. The historic 1976 Olympic Games in Montreal was the first Olympics to be held in Canada. The logo for the ’76 Olympics was so simple and obvious, it blended an M with the five Olympic rings. It had maximum effect with minimal design. A perfect example of the Canadian design ethos at the time. Design Canada, explores the symbols that shaped our past. Iconic corporate logos such as Canadian National Rail, Canadian Broadcast Company and Roots have become a part of the iconography of Canada. These symbols have stood up over time and have been steadfast in their representation to date. As the film takes us through the history and development of the Canadian identity it brings to question if Canadian design truly represents Canadians today? Are the graphic designers of today working collectively to better represent all Canadians now in 2019? It makes one look around to see how our story is told in the present and think about the plan for how it will be told in the future. I reached out to Director, Greg Durrell to talk to him about the film and his experience as a filmmaker on Design Canada. Greg, this is your first experience directing a film, tell us about why you decided to take on this project. With your background as a graphic designer how did you learn about the film making process and what it takes to direct a full-length documentary film? I made the film because it was something I wanted to watch! I realized that Canada was about to lose a huge piece of our history and I didn’t see anyone else stepping up to record it, so I thought why not me? Luckily two experienced filmmakers Jessica Edwards (producer) and Gary Hustwit (executive producer) joined the Design Canada team and they taught me how to make a film. I understand it took 6 years to make this film and that your Kickstarter campaign brought in close to $100,000. Was that enough and was it a challenge finding funding along the way? Kickstarter brought in around 125K CAD, but that doesn’t mean we took that home. You have to pay Kickstarter, the PR company, then produce the rewards, etc. but it was a huge step forward for us. Along the journey I was turned down by nearly ever traditional film funding agency in this country, because it was a “design” topic and not “art” and they didn’t really understand it, but I used this as motivation as to why this film needed to be made. Luckily TELUS Originals and Shopify stepped up to become associate producers and helped provide funding to finish the film. What was it like doing the in-depth interviews with the Canadian design legends? Have their words inspired your graphic design career? Absolutely, the philosophy behind their work, to say more with less, inspired me to want to become a designer. I hope some of these characteristics are evident in our work at Hulse & Durrell. The film talks about the influence of European modernism on Graphic design in the 60’s and 70’s. Has Canadian design completely moved away from this aesthetic? How would you describe the current design era of today? The aesthetic still surrounds us every day from our Maple Leaf Flag, to the Federal Identity Program, to our national broadcasters, corporations, organizations, etc., but this movement was more of a philosophy rather than an aesthetic. It’s hard to say precisely where we are today because there are so many different thoughts on what design is or should be. However, one thing is for certain, that the principles behind modernism, to say more with less, is as relevant today as it was in the 60s. The film takes you to a point of question – leaving you wondering where this journey of Canadian identity defined graphic design will go? What direction do you think it is going and where do you think it needs to go to properly represent Canada today and the years to come? I think this is up to the people to decide, but I can’t wait to see how the next wave of immigration, people from all over the world, shape the next version of Canada.